Home / Blog / Kangaroo Care / What is kangaroo mother care? Skin-to-skin contact between mother and child is important. According to the Centers for Disease Control and Prevention, 1 in every 10 infants in the U.S. in 2015 was born prematurely. Premature birth, which occurs anytime prior to 37 weeks of pregnancy, can result in a number of complications for the baby, including vision and hearing problems, breathing difficulties, feeding problems and developmental delays. The CDC reported that in 2013, 36 percent of infant deaths were related to preterm causes. However, a simple method has been found to help these infants who arrive too soon. When you have a new baby at home, snuggling him or her close is probably second nature. It turns out that there's a reason for that. Research has found that skin-to-skin contact while holding your infant close offers a number of benefits for the child, particularly in the case of premature babies. This strategy has developed into a method called kangaroo mother care. Whether your baby is born early or full-term, kangaroo mother care is a strategy that can provide important benefits for your baby now and later in life. Kangaroo mother care is the method by which an infant is held involving skin-to-skin contact. The baby is positioned against a care giver's bare skin, naked other than a diaper and perhaps a covering on the back if necessary, usually a thin blanket or the parent's shirt. The child is held upright and snuggled against the chest for extended periods of time, typically at least one hour. "Mothers in Bogota were taught to hold their babies upright against their chest under their shirt." Kangaroo mother care was developed in the 1970s in Bogota, Colombia. According to The Atlantic, pediatrician Edgar Rey introduced the strategy to the Instituto Materno Infantil in 1978 in a desperate effort to reduce high mortality rates among premature infants. Instead of putting the premature babies into incubators, where they were rarely touched, the doctors and nurses taught mothers how to hold their babies upright against their chest under their shirt, skin-to-skin. Rey was inspired by the behavior of kangaroos, who carry their underdeveloped babies in their pouch. This parallel inspired the strategy's name. A 2017 study that followed-up on kangaroo mother care babies 20 years later found that the method in a group of preemies led to lower levels of behavioral problems and greater growth in areas of the brain related to memory and learning. "This study drives home the point how important simple interventions in the NICU are to long term outcome," Dr. Amy Hair, a neonatologist at Texas Children's Hospital in Houston, told Forbes. "This is a simple intervention. It doesn't have any harmful effects. If anything, we should make it universal standard of care." Studies such as this have encouraged many health care professionals to promote the method for both premature and full-term babies immediately after birth and in the weeks that follow. Premature infants can especially benefit from the skin-to-skin contact provided by kangaroo mother care after birth. As the providers in Bogota found in the 1970s, skin-to-skin contact through kangaroo mother care offers numerous benefits to preemies. 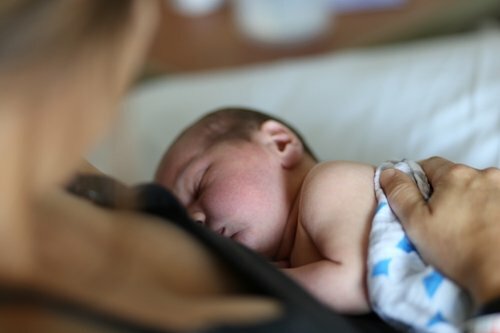 "Physiology and research provide overwhelming evidence that kangaroo mother care is not only safe but superior to the use of technology such as incubators," Dr. Nils Bergman, senior medical superintendent at Mowbray Maternity Hospital, told Parents magazine. "Depriving babies of skin-to-skin makes alternative stress pathways in the brain, which can lead to ADD, colic, sleep disorders, among other things." Improved supply of breast milk. Increased feeling of being in control. Greater bonding with the baby. Improved confidence in the child's care. In short, prolonged skin-to-skin contact makes both the baby and the parent or guardian feel more secure, leading to both physical and emotional benefits. However, in daily life, you don't always have extended periods where you can sit uninterrupted with your baby. To make kangaroo mother care simple, consider using the NuRoo Pocket. The babywearing shirt, created from soft, breathable fabric, allows you to hold your baby close while keeping your hands free. The simple style of the shirt means that no wrapping or knotting is required. You simply put on the Pocket, insert your child and fold the wings. The NuRoo Pocket is available on Amazon.com and Target.com. Order today to experience the benefits of simplified kangaroo mother care for yourself.